I didn’t do anything quilt-related yesterday. Well, that’s not entirely true. The Woodworker and I spent the day on the motorcycle. 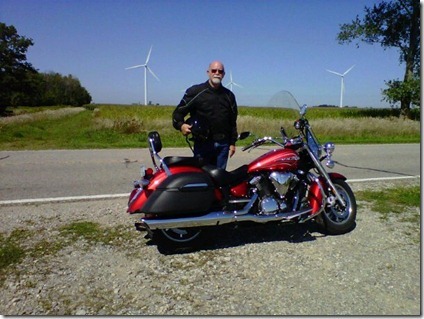 We live in Flushing, Michigan, and hubby wanted to visit a wind farm up in the thumb of Michigan. That meant we went by Caro, home of Merrie Miller and her new shop, Catty Wampus. So we stopped by for a few minutes as we went through town. SO nice to meet her! She also is a biker, so we’re hoping to get together soon to take a ride. This shows (kind of) where we went up into the thumb. 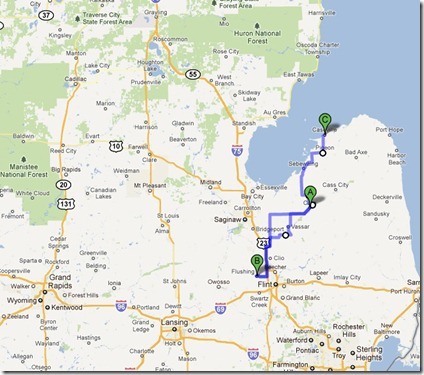 Marker B is Flushing, A is Caro, C is Caseville, Michigan. We went over 240 miles yesterday, and today my body is reminding me of that. Muscles I didn’t know I had are a little tender, but not too bad. 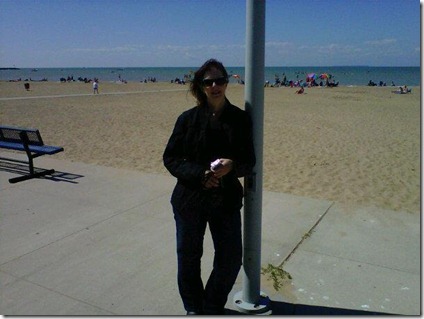 We went to the beach in Caseville for a brief break and to stretch our legs. 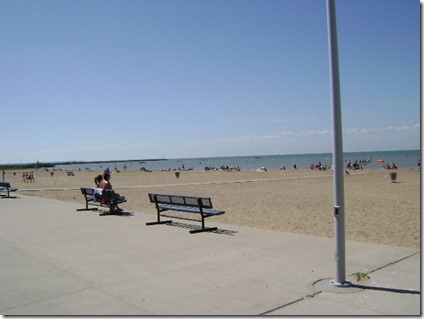 Caseville is on Saginaw Bay in Lake Huron. Sure not getting a suntan in this picture!!! 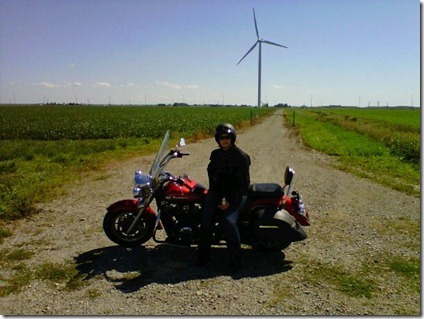 See the turbine off in the distance behind me? There are dozens of those all over the area in Pigeon, Michigan that generate electricity. It’s so cool to see them all spinning! You can see more behind the Woodworker in this shot. On the way back we stopped for dinner in Birch Run… then headed home. What a great day! I looked at the link for the quilt shop. It looks really interesting. I liked the quilts on display. Do you know anything about Edyta Sitar coming to Millington in October? Please let your readers know that an exhibit of Amish Quilts in coming to the Flint Institute of Arts September 10 through November 13, 2011. There will be a lecture by the owner of the antique4 quilts on September 9 for FIA members. Looks like a fun day, Caron, so glad you got to stop at the shop! Where did you eat in Birch Run? I miss it there – lived there for a bit.